FILE - Waste removal experts work to remove hazardous black sludge from a garbage dump in Abidjan, Ivory Coast, Sept. 17, 2006. Many victims have still not received compensation. In Ivory Coast, the government announced earlier this month that all locations affected by the dumping of toxic waste have been cleaned. Nine years ago, a ship named the Probo Koala unloaded toxic waste in over a dozen places in and around Ivory Coast's biggest city, Abidjan. At least 15 people died and tens of thousands were sickened, according to local authorities. To this day, many victims are still awaiting reparations. Farmer Salid Ouédraogo lives nearby a patch of land 10 kilometers north of Abidjan that used to be a no-go zone but which the Ivorian government now says is decontaminated and safe. He remembers the day he walked by a pool of black liquid with his one-year-old son on their way to his field. At first, people thought it was some kind of weed killer, he said. But the smell was just too strong, like hot pepper. In 2006, tanker trucks illegally dumped several hundred tons of toxic waste into open-air spots in and around Abidjan. The waste came from the vessel Probo Koala, chartered by Dutch oil trading firm Trafigura. Ouédraogo said his son started to feel sick later that day. His son's body became covered in a pimples-like rash and open wounds. When they breathed that smell, it gave them headaches, colds, and nausea. His son is still sick, he added, and up until very recently, the particular odor still could be smelled when it rains. 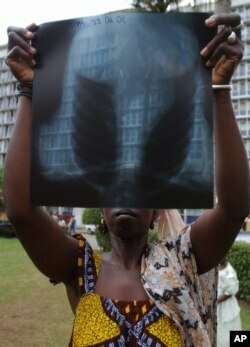 FILE - A woman who did not want to be identified, claiming that she has lung damage after a toxic waste discharge in Abidjan, holds up her lung x-ray at a hospital in Abidjan, Ivory Coast. A study by the Ivorian National Institute for Public Health found the toxic waste caused the death of at least 15 people and sickened tens of thousands. Trafigura has always denied being liable for that. In 2007, it agreed to pay over $160 million in exchange for being exempt from future prosecution. It paid an extra $37 million to settle a court case in the U.K. two years later. The money was meant to be used to clean the dumping sites and compensate the victims. But a lot of victims still have not received any compensation, said Charles Koffi, president of Renadvidet-CI, an association of victims. In terms of reparation, the situation is catastrophic, Koffi said. There have been blatant misappropriations of funds. Koffi said about one third of the 100,000 victims from the 2007 settlement have not received anything, and neither did the vast majority in the 2009 case. For the latter, he blames a victims' association for trying to embezzle the funds. Bogus victims' associations were set up to take advantage of the legal process, said Fatoumata Kindo, who lives near one of the dumping sites. Every day, so-called "representatives" of victim's associations show up and tell the victims they must give money to register so they can get indemnity. When you're sick and you have no one to help you, and they tell you 'give 500 francs and you'll get 3 million in reparations, it's easy to fall for it, she says. In addition, Amnesty International Ivory Coast director Hervé Delmas Kokou said the health risk has not been assessed. “We observe diseases that are somewhat new here, he says, cancers coming up at any time, a fair amount of CVAs too. he adds, specialists will tell you the rates are quite high. Where does this come from? I'm not saying it only comes from toxic wastes, but we need to know,” said Kokou.